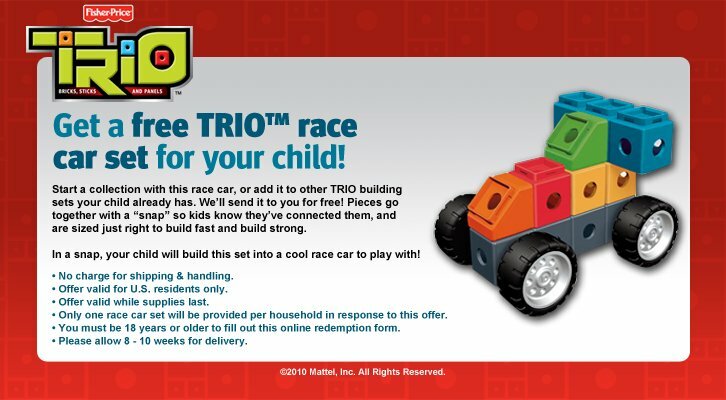 Sign up to get a FREE TRIO race car set from Fisher Price! It even ships for free and is valued at $9! I love freebies that I can use for birthday gifts, Christmas gifts, or stocking stuffers! Do you ever use samples or freebies for gifts? Oh yes! I acutally "adopted" a college student from church and got a bagful of stuff to send with her to college. Mostly things I've gotten free or for next to nothing from my shopping trips to CVS, Kroger and Publix. I plan to send her care packages throughout the year as well, and have a list of her favorites so I can look out for more great deals.